This is not your great-grandfather’s fire-fighting gear. “Readiness has to do with making sure our customers are ready to do their jobs—and all of our customers are either in the military or are first responders,” Schwartz says. “That grew into a greater concern about industrial chemicals and blood-borne protection, and today it has evolved further into CBRN [chemical, biological, radiological, and nuclear] protection.” One of Lion’s new products, the Janesville CB-XiT, is a fire-fighting suit designed to protect first responders as they escape from heat, moisture, or chemical or biological agents. In today’s world, there are more threats to protect yourself against. As the world has grown increasingly complex, Lion Apparel has also evolved, from a clothing and dry-goods shop into a supplier of uniforms for service station workers into, today, a global (but still family-owned) company that outfits police and fire department first responders and members of the military. According to Schwartz, Lion’s annual revenue exceeds $100 million (he declined to give a more specific figure) and its clients include city fire-fighting departments in Baltimore, Chicago, Dallas, Houston, Philadelphia, Portland, San Diego, San Francisco, and Seattle as well as fire-fighting companies in Canada and overseas. “We fulfill the personal safety, readiness, and identity needs of our customers,” says Schwartz, citing the company’s mission statement. “Readiness has to do with making sure our customers are ready to do their jobs—and all of our customers are either in the military or are first responders, so being ready to do their jobs is a very important and serious matter. 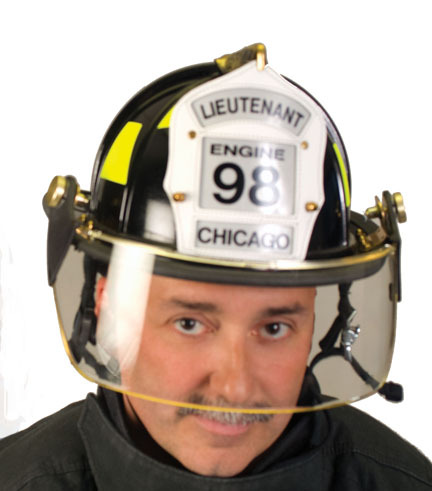 Lion employee Doug Plyman models the company’s Janesville Turnout Gear worn by members of the Chicago Fire Department. managed the fraternity’s refrigerator rental business. 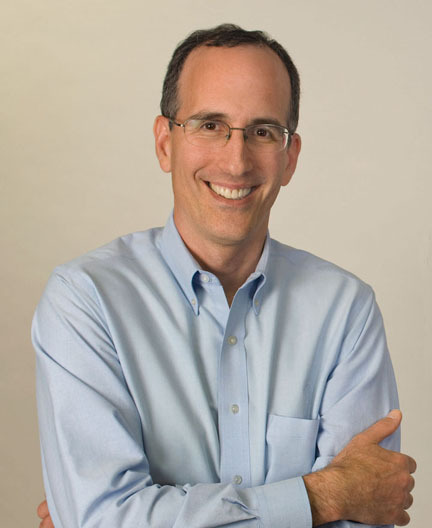 Upon graduating from Northwestern with a master’s in management in 1989, Schwartz joined Lion, the family business. He began in the client services unit, providing reports on the company’s performance to customers, then moved into leadership positions in sales before becoming chief operating officer and, in 2006, chief executive officer. Schwartz’s brother, Andrew, is corporate counsel. Schwartz is married to Melissa Kotler Schwartz. They have two children, Olivia, 14, and Sam, 10. FIRST, AS COO, AND, NOW, AS CEO, Schwartz has been a key figure in orchestrating Lion’s overseas expansion. Lion now operates in seven countries and has joint ventures with companies in Germany, New Zealand, and Spain. Among Lion’s international clients are the Hong Kong Fire Brigade; the National Fire Services of Chile and Ghana, respectively; and the Saudi Arabian National Civil Defense Fire Service. Through its joint venture with Germany’s Hellmann Worldwide Logistics, Lion has a contract to outfit nearly a million German soldiers and reservists. Schwartz reports that Lion has about 750 employees in the United States and another 500 or so globally. Lion operates its own factories in Kentucky; Ohio; and Ontario, Canada, and contracts with factories in the Caribbean Basin, China, and Eastern Europe. “We take the use of contractors very seriously, and we screen them and monitor them very closely to ensure that they are using proper practices with their employees,” Schwartz says. The firm that became Lion Apparel was started 112 years ago by CEO Steve Schwartz's great-grandfather, William Lapedes, a Latvian immigrant. 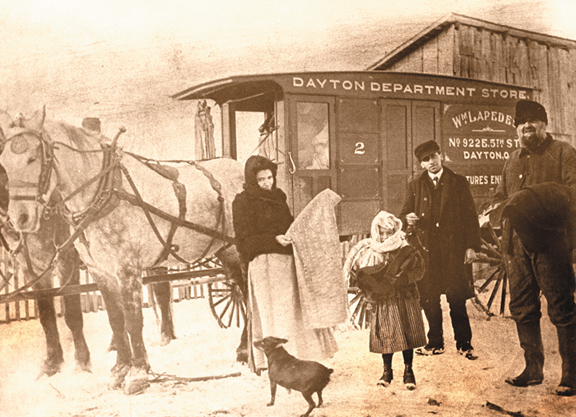 The company's first asset was this wagon, from which Lapedes and family sold dry goods and clothing around the Dayton, Ohio, area. It is still a family-run business with William's grandson Richard Lapedes as chairman of the board and Schwartz’s brother Andrew as corporate counsel. That’s how Schwartz, using what he calls “my Swarthmore-developed engineering instinct,” has led the company to be the industry leader in the development of innovative new products. He cites the patented ISODri system for firefighter turnout gear as the most dramatic example and the one that gives him the most pride. It is made with a system of water resistant and flame resistant materials that keeps the firefighter safer and drier, reducing the risk of serious burn injury. “After wetting it and putting it under a heat load, the standard system of materials reaches first-degree burn temperature within 30 seconds, but our ISOdri system remains far below that temperature level even after two minutes,” Schwartz says. Looking ahead, he says he “expects to continue to lead Lion on the trajectory it’s on now”—again, per the company’s mission statement, fulfilling the “personal safety, readiness, and identity needs” of firefighters, police officers, and members of the military. Elizabeth Redden is a freelance writer based in New York.